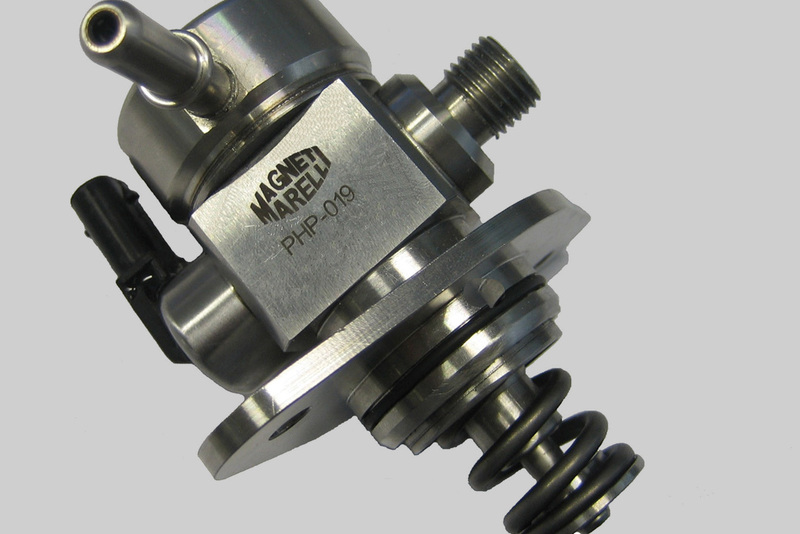 The Magneti Marelli PHP is a pump with a single piston mechanically operated by a multi-lobe (2, 3 and 4 lobes) cam and with flow rate control by means of an electromagnetic actuator. The piston with 10-mm diameter ensures delivery of high flow rates, consequently the pump is also suited for engines with high power and cubic capacity. Thanks to its compact size, reduced weight and flexible interface customization (fixing flange, fuel inlet and outlet and electrical connection), it can be easily installed on different types of engines, satisfying the needs of smaller and smaller layouts. Since it is capable of generating pressures from 40 to 200 bars, this pump can meet the needs of systems currently being developed and produced, offering a wide range of pressures; it incorporates a maximum valve for protection of the high pressure circuit and an inlet dampener that limits pressure fluctuations on the supply circuit. Equipped with an electromagnetic actuator that acts on the intake valve, it allows flow rate control with hit to hit accuracy and, thanks to the dedicated software, the gasoline collector pressure adjustment, varying it according to the needs of the engine under its different operating conditions (speed, delivered torque, environmental conditions, etc.). Thanks to the adjustment of the flow rate, and consequently of the pressure, only the gasoline actually needed is pumped at high pressure, thus limiting energy consumption to the bare minimum. The Magneti Marelli pump incorporates a special device that limits the noise generated by the electromagnetic actuator, whose “ticking” is often viewed as a malfunction by the user and which, in GDI engines, represents a disadvantage in the switchover to this type of technology. This patented device is one of the strength of the Magneti Marelli pump compared with pumps made by other manufacturers, as it effectively aims to eliminate the very source of the noise. Since it is made entirely with corrosion-resistant materials (in the components that come into contact with the fuel), the pump can be used with all types of gasoline worldwide. Due to the needs being expressed by the market and by the automotive sector, Magneti Marelli is currently studying evolutions of the current pump aimed at further increasing the maximum deliverable flow rate for special applications such as trucks/pick-ups on the U.S. market (increasing the piston diameter) and at increasing the operating pressure.